Several bars in New York City already proudly display the Good Beer Seal. But Tuesday night, seven more bars were added to this prestigious group. Jimmy Carbone reveals the seven new Good Beer Seal Award winners. to: Fourth Avenue Pub, Bierkraft, Brouwerij Lane, Double Windsor (a personal favorite), Misson Delores, Stag’s Head and Waterfront Ale House (located in both Brooklyn and Manhattan). As part of the committee of beer lovers and enthusiasts chosen to decide on this year’s winner, I was happy with the results and I think we added some great locations to a list that already includes the likes of Jimmy’s #43, Against the Grain and Sunswick. 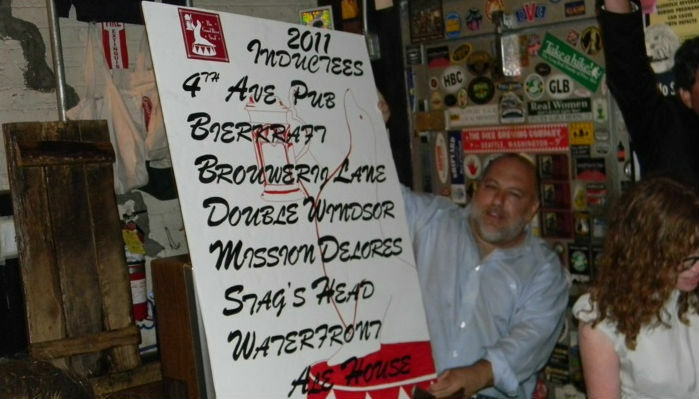 But you’ll notice that the vast majority of the new inductees, with the exception of Stag’s Head and one of the two Waterfront locations, are located in Brooklyn. This is certainly a sign that Brooklyn is head and shoulders above the other boroughs when it comes to serving good beer — and Manhattan’s really not that far behind. So I issue this challenge to Queens, Staten Island and The Bronx: cultivate your beer scene and open some good beer bars. Sure, Queens has Sunswick and the Bronx has The Bronx Ale House — but Staten Island is without a Good Beer Seal representative and one bar each in the other two boroughs is just not enough. In fact, as a Queens resident, I will be doing all I can to get some new beer spots here in my borough! If you happen to come across the red seal in your travels, be sure to stop in for a beer. It’ll definitely be worth it. I dare say Kilmeyers in the shadow of th outerbridge Crossing on Staten Island deserves it after 100 years of serving german ales.